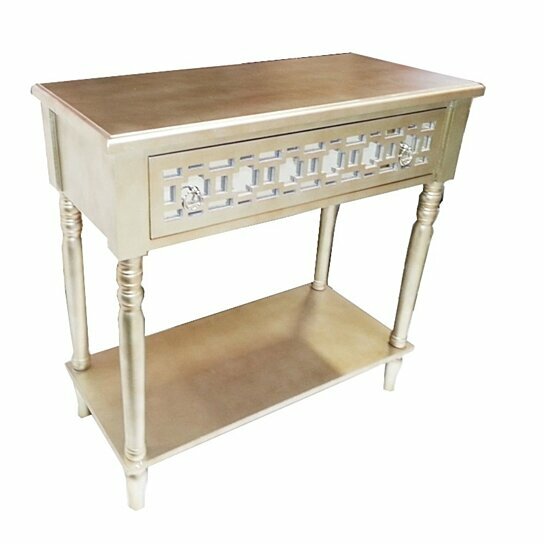 Add shimmer to your living room by getting hold of this golden TV table stand. This amazing furniture is classy that it will certainly lend your home chic touch. This vintage yet stylish table stand is designed to suit range of home interior. There is a drawer and a shelf at the bottom of the table. The drawers have intricate cutout design that makes it look attractive at the same time. This table is wooden and dyed in shimmering golden color. Utilize it to keep TV set or another decorative. It can be part of living room, bedroom, or guest?s room. Stylish design and texture that crafted durably. This one is easy to clean and maintain.